The winner of two Silver Bears in 2013 for An Episode in the Life of an Iron Picker, Bosnian director Danis Tanović returns to the Berlinale competition with his spirited new film Death in Sarajevo. Adapted from the 2014 play Hotel Europa by Bernard-Henri Levy, Tanović incorporates his source material’s monologue delivered by a French VIP guest (played by Jacques Weber) on the anniversary of the assassination of Archduke Franz Ferdinand, into an escalating drama at Hotel Europe. 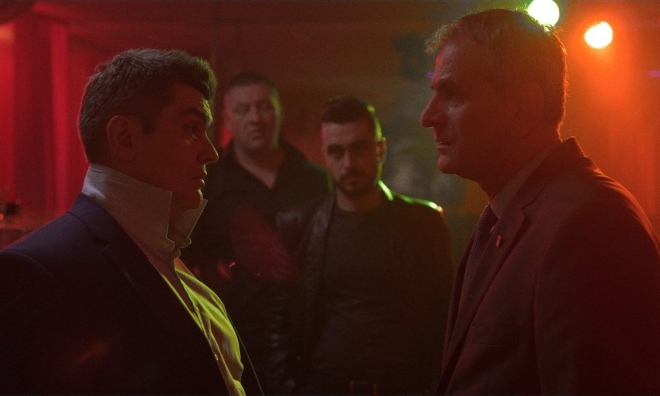 Hotel manager Omer (Izudin Bajrović) is in deep debt from gambling and trying to keep the hotel running. Not having paid his staff in two months, they’re planning a strike timed for when the diplomats arrive for a conference. Led by laundry supervisor Hatidža (Faketa Salihbegović Avdagić), who has worked at the hotel for thirty years, the striker’s complaints are initially an inconvenience to receptionist Lamija (Snežana Vidović), who is also Hatidža’s daughter. Employing the service of his lender’s thugs to suppress the strike, Omer’s attempts to control his workers become increasingly brutal. Meanwhile, a TV reporter is stationed on the roof, conducting interviews about the assassination anniversary, one of whom is the descendent and namesake of the 1914 assassin, Gavrilo Princip. Elsewhere, a security team conduct surveillance of the French VIP, who rehearses his speech alone in his room. Propelled by escalation towards inevitable catastrophe, Death in Sarajevo whips along, focusing on Lamija as she attends to the problems of the day. Several long takes follow her movements through the enormous hotel lobby, along corridors and to the basement laundry, taking in the full contrast of the hotel’s clean and glamorous façade and grimy inner workings. Lamija’s resistance to the strike is explained by her obvious career aspirations, as she asserts her authority over colleagues on her way, assigning tasks and passing on instructions with a confidence verging on briskness. Among the goings on within the hotel, hers is the most engaging, as she eventually realises the extent of Omer’s selfish corruption and her dismissal of her mother’s Marxist politics start to seem unjustified. Both Salihbegović Avdagić and Vidović give naturalistic performances as mother and daughter, convincing in their affectionate opposition of one another. The rooftop historical/political debate provides context and an opportunity for provocative questions such as; if Princip were alive today, who would he assassinate? Whilst the sections seen of Weber’s monologue – his musings on the complexity of hindsight – “Why remember Shoah if it doesn’t prevent Srebrenica?” demonstrate Tanović’s passionate engagement with the Bosnian War in relation to contemporary politics. Within this dense set-up, less successful is the comedic handling of a distracted security guard, whose actions lead to a shocking moment of violence that feels like an unnecessary narrative climax. The great success of Death in Sarajevo is the simplicity with which Tanović handles Lamija’s fate that expresses the humanism the director has so carefully displayed in his previous work.